Some studies find that the immune system, which protects our bodies from foreign invaders, plays a part in Alzheimer's disease, though the actual role of immunity in the disease is a mystery. A new Duke University study in mice suggests that in Alzheimer's disease, certain immune cells that normally protect the brain begin to abnormally consume an important nutrient: arginine. Blocking this process with a small-molecule drug prevented the characteristic brain plaques and memory loss in a mouse model of the disease. The brains of people with Alzheimer's disease show two hallmarks -- 'plaques' and 'tangles' -- that researchers have puzzled over for some time. Plaques are the build up of sticky proteins called beta amyloid, and tangles are twisted strands of a protein called tau. In the study, the scientists used a type of mouse, called CVN-AD, that they had created several years ago by swapping out a handful of important genes to make the animal's immune system more similar to a human's. Compared with other mice used in Alzheimer's research, the CVN-AD mouse has it all: plaques and tangles, behavior changes, and neuron loss. "If indeed arginine consumption is so important to the disease process, maybe we could block it and reverse the disease," said senior author Carol Colton, professor of neurology at the Duke University School of Medicine, and a member of the Duke Institute for Brain Sciences. The gradual onset of these symptoms in the CVN-AD mouse gave researchers a chance to study its brain over time and to focus on how the disease begins, said the study's first author Matthew Kan, an MD/PhD student in Colton's lab. Looking for immune abnormalities throughout the lifespan of the mice, the group found that most immune system components stayed the same in number, but a type of brain-resident immune cells called microglia that are known first responders to infection begin to divide and change early in the disease. 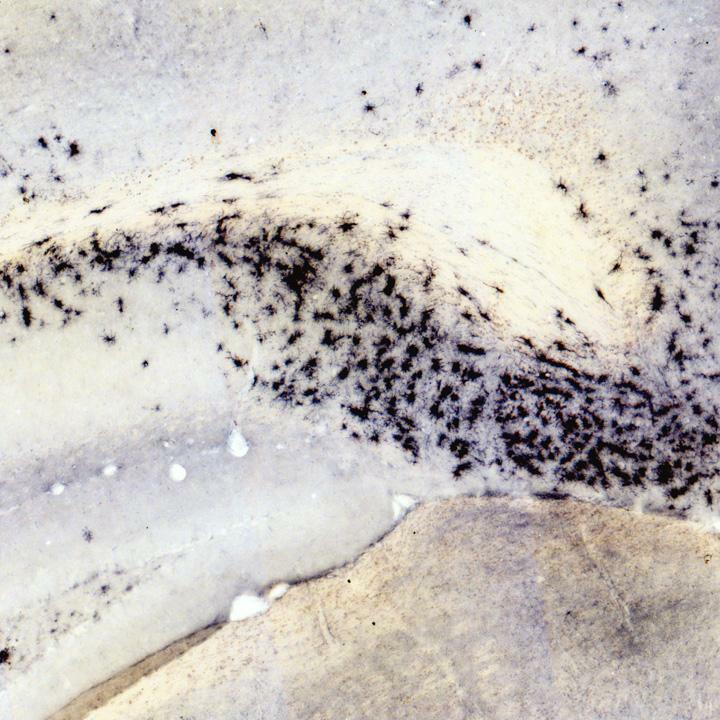 The microglia express a molecule, CD11c, on their surface. Isolating these cells and analyzing their patterns of gene activity, the scientists found heightened expression of genes associated with suppression of the immune system. They also found dampened expression of genes that work to ramp up the immune system. "It's surprising, because [suppression of the immune system is] not what the field has been thinking is happening in AD," Kan said. Instead, scientists have previously assumed that the brain releases molecules involved in ramping up the immune system, that supposedly damage the brain. The group did find CD11c microglia and arginase, an enzyme that breaks down arginine, are highly expressed in regions of the brain involved in memory, in the same regions where neurons had died. Blocking arginase using the small drug difluoromethylornithine (DFMO) before the start of symptoms in the mice, the scientists saw fewer CD11c microglia and plaques develop in their brains. These mice performed better on memory tests. "All of this suggests to us that if you can block this local process of amino acid deprivation, then you can protect -- the mouse, at least -- from Alzheimer's disease," Kan said. DFMO is being investigated in human clinical trials to treat some types of cancer, but it hasn't been tested as a potential therapy for Alzheimer's. In the new study, Colton's group administered it before the onset of symptoms; now they are investigating whether DFMO can treat features of Alzheimer's after they appear. Does the study suggest that people should eat more arginine or take dietary supplements? The answer is 'no,' Colton said, partly because a dense mesh of cells and blood vessels called the blood-brain barrier determines how much arginine will enter the brain. Eating more arginine may not help more get into the sites of the brain that need it. Besides, if the scientists' theory is correct, then the enzyme arginase, unless it's blocked, would still break down the arginine. "We see this study opening the doors to thinking about Alzheimer's in a completely different way, to break the stalemate of ideas in AD," Colton said. "The field has been driven by amyloid for the past 15, 20 years and we have to look at other things because we still do not understand the mechanism of disease or how to develop effective therapeutics."